The website for ASLA (American Society of Landscape Architects) has a fairly new section devoted to resources for sustainable design and planning. If you haven’t wandered across it already you should take a minute to see what it has to offer. It is aimed at national and local policymakers, government agencies, design professionals, planners and students. Resources include hundreds of project case studies, research papers, organizations and other government resources on sustainable design. 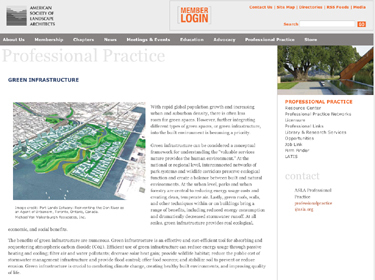 Green Infrastructure (www.asla.org/greeninfrastructure) covers park systems, wildlife habitat and corridors, urban forestry and green roofs. Sustainable Transportation (www.asla.org/sustainabletransport) covers sustainable transportation planning, siting sustainable transportation infrastructure, designing safe and visually appealing transportation infrastructure, green streets and reducing the urban heat island effect. Sustainable Urban Development (www.asla.org/sustainableurban) covers fighting sprawl, sustainable zoning, reusing brownfields, investing in downtowns, open spaces and sustainable urban design. Livable Communities (www.asla.org/livable) covers sustainable land use, place making, green schools, sustainable housing, sustainable employment growth and health, safety and security. Combating Climate Change with Landscape Architecture (www.asla.org/climatechange) covers site planning, open spaces, plant selection, stormwater management and other areas.